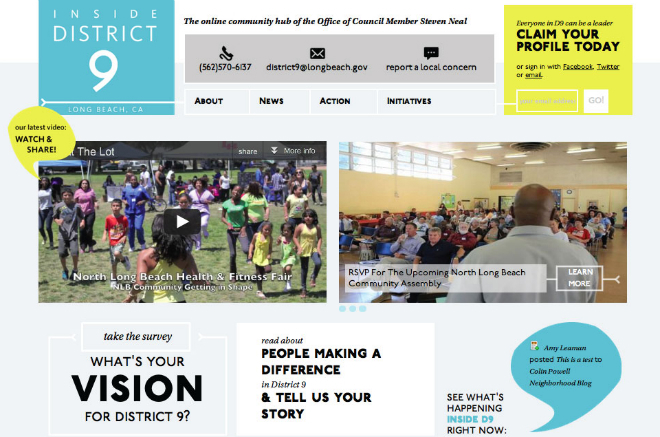 We’re pleased to announce the launch of our latest project: Inside District 9, the online community hub of the Office of Long Beach California Council Member Steven Neal. This project was a collaborative effort between cStreet Campaigns & the District 9 staff aimed at applying their grassroots, neighbourhood based model of engagement to a the Council Members website & constituent management system. Neighbourhood tags that provide users a geographically curated experience throughout the site. A custom developed “Personal Feed” that pulls in site activity based on the users friends, followers and neighbours. An issue reporting tool that lets constituents alert District 9 staff of anything from a broken street light to a policy request that notifies staff and make sure every constituent issue is resolved in a timely fashion. Over the next few weeks we plan on releasing a series of blog posts looking at how Council Member Neal’s staff is using NationBuilder to improve communications, engagement and issue management. But for now, we just want to send a big congrats to Council Member Neal, Rex Richardson (District 9 Chief of Staff) and their amazing team on the launch today! You guys are the best!